Municipal Elections are held on the third Monday of October every four years. 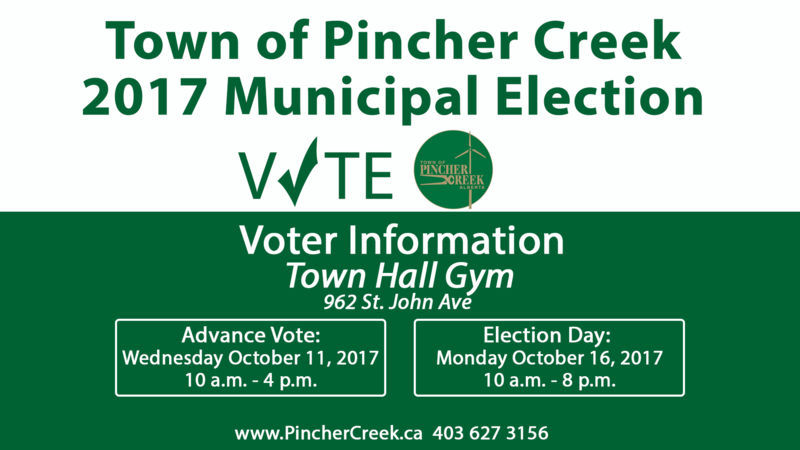 The next scheduled Municipal Election for the Town of Pincher Creek will be October 16, 2017. October 11, 2017 10 a.m. – 4 p.m.
October 16, 2017 10 a.m. – 8 p.m.
Institutional voting stations at the Hospital, Vista Village, Crestview Lodge and Whispering Winds will be available on October 16th only. - Government issued photo identification which establishes your name and current address (passports are not acceptable forms of identification as they do not establish your current address). - Document which establishes your name and address of your current place of residence, such as your most recent utility bill, tax assessment report, etc. as required by section 53 of the Local Authorities Election Act. Nomination Packages are available at the Town Office, the packages include additional information on municipal elections. Forms must be filed on Nomination Day, September 18, 2017 between 10:00 am and 12:00 pm (noon) at the Pincher Creek Town Office. No monetary deposit is required to submit Nominiation Papers. If you have any questions, please don't hesitate to contact the Deputy Returning Officer, Lou Burnham at dicklou@shaw.ca or 403-627-3045.